The DG5000 Series is a waveform generator combining multiple capabilities including Function Generation, Arbitrary Waveform Generation, IQ Baseband Source/IQ IF Source, Frequency Hopping Source (optional) and Pattern Generation (optional). The DG5000 comes in single and true, independent, dual-channel models that provide adjustable phase and ground levels between the two channels. These instruments utilize Direct Digital Synthesizer (DDS) technology providing stable, precise, low distortion signals. Control signals from the user-friendly interface and layout or program the instrument remotely over USB or LXI to improve efficiency. The DG5000 Series generator is our fastest function generator. Create sine waves to 350 MHz, square waves to 120 MHz, Pulses to 50 MHz, or 250 MHz of noise bandwidth. Add high speed sweep, burst, or modulations as well. Deep memory 128 Million point arbitrary waveforms Create high speed waveforms with more detail than ever. These arbitrary waves are some of the longest available in the industry. The DG5000 Series generator is our deepest memory arbitrary generator. 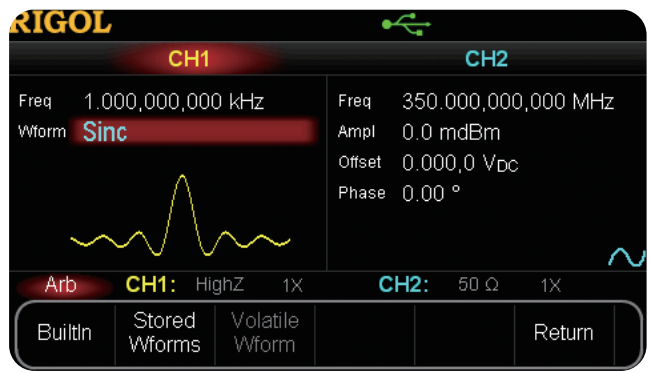 Using the UltraStation software, users can create 128 Million point entirely custom waveforms. This capability is vital to applications with long time constants or emulation repitition like radar and sonar where how the data changes over milliseconds is critical. Rack Mounting Kit for a DG5000 Series Generator. May be different than image. Rack kits are different for each instrument.